I’ve had a fascination with space and the larger cosmos since I was a child. To some extent, who hasn’t? What lies outside our reach is always the most tantalizing. Between one uncle that worked at Jet Propulsion Laboratories and a father who was a science fiction aficionado, I couldn’t avoid being pulled into the fantasies and realities of space, its mystery, its allure…and its danger. Yet all the “space music” I had grown up hearing seemed too facile, comfortable, and overall too…optimistic? As formative as it was to my musical development, ambient and new age music (the two share a very blurry border, despite each genre’s denials to the contrary) seemed too naive and utopian in its assessment of the human condition and the challenges we face as a species. So I went headlong into an exploration into what outer space meant to me: only partially knowable, certainly majestic, deeply transformative, and not a little bit terrifying and of course utterly indifferent to our species’ success or failure. This album’s techniques are most closely related to my 2018 album, Chrysalis. Like that album, this body of work was created primarily on a Buchla modular synthesizer. Only the second track features a Ciat Lonbarde Tetrax Organ, but otherwise this is a 100% Buchla album, if you’re willing to forgive the few Eurorack modules in the Buchla Blade format adapter in my case. I chose this instrument – a clone of 200 series designs, not the contemporary Buchla USA 200e modules – because of its dreamlike quality and raw tone, and its associations to “space music” of the 1970s. 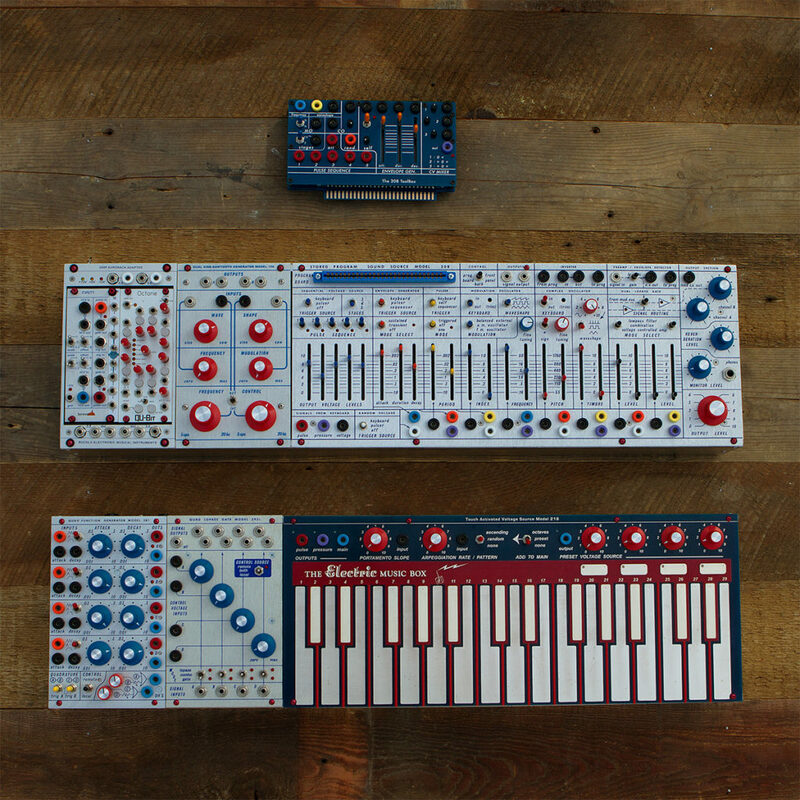 Unlike 200e modules, the Buchla 200 series clones are based on older circuit designs, are entirely analogue, and exhibit a less controlled, raw set of timbres than many of the other instruments I own. The system conveyed a sense of intensity and stellar aspiration that felt right for the project. Like my Études series, this album really focused on single-pass performances recorded in real time. A few specific performance techniques rear their head throughout the album. One is letting the Buchla 218’s arpeggiator run free, uncorrelated to the primary tempo of the track, to have its notes masked or unmasked by either manual performance or other intervening envelopes. Another was amplitude modulation, an all-too-overlooked method of timbral shaping that impacts harmonics without disrupting fundamental pitch. I don’t think there is a track on this album that doesn’t utilize amplitude modulation, on a music platform better known for its frequency modulation characteristics. For reasons I don’t quite understand, I also feel more free with clocking and tempo on the Buchla than on Eurorack or other systems. Each song has between one and four tracks, each performed live. Most are two or three track live takes, with a few different voices of the Buchla tracked separately, with a handful that had one or two overdubs. My Buchla features the legendary 208 module, which is the sound producing module in the Buchla Music Easel, and as a result, its spring reverb and massive low-pass gates dominate the sound. However, plenty of digital effects enter the picture. ValhallaDSP reverbs, SoundToys DevilLoc Deluxe and Decapitator, DMG EQuilibrium, and other plug-ins help sculpt the sound of this album. Many of the tracks feature distorted parallel compression on the entire mix, but added back in at barely-perceived levels. This allowed me a degree of tonal control that didn’t involve actual EQ. The mixes were passed entirely through tubes, for both compression and EQ. If it’s not been obvious already, each of my recent releases is quite different, and there’s no reason to expect that to change. You’ll certainly hear a blending of electro-acoustic and electronic over my next few releases, and there are things in my album release pipeline that are also intensely experimental (compared to my past releases). I promised it’d get weird, and this is just the beginning. Stay tuned!